“The thesis is there to prove that we are no longer just students, absorbing information from other people. In the thesis project, we find our own sources and reach our own conclusions…we truly have to create something.” This, according to one of my students last year, was the highlight of Cary Christian School’s senior thesis project. After thirteen years of school the tables are turned: the students are now the teachers, and the teachers are the ones asking the questions. I thought about this reversal earlier this year as I sat in the bleachers of the gym for my second grade daughter’s Christmas program. As she and her classmates stood before us reciting Scripture from the Gospel of Luke and singing “Joy to the World,” I realized (with a bit of shock) that in ten short years these same boys and girls will be seniors, and that April they will stand at the podium in the auditorium teaching their classmates, parents, and teachers about theological disputes, bioethical dilemmas, and political controversies. Those second graders look small and cute now, but watch out! Give them a few more years of literature, science, math, languages, history, logic, and rhetoric, and they will be able to uphold and defend their ideas better than any other eighteen-year-old you’re likely to meet. The senior thesis, as you may know, consists of a 15-25 page research paper, written during the second and third quarters of the senior year, followed by a 25-minute oral presentation and defense during the fourth quarter before an audience and a panel of three faculty members. As the Rhetoric II teacher, my job is to guide them through the process of selecting thesis topics, researching and writing their papers, and preparing for their oral presentations. The seniors are understandably nervous, as you or I would have been if we had done this kind of project in high school (and most of us definitely did not). However, as I reassure the students, every one of them is already prepared to do this project by the time they reach my class. They have already written papers, engaged in debates, presented to their classmates, and stood before large crowds at assemblies. By the time they are seniors, all they need me to do is to coach them through it. 1. Young people must develop real communication skills. The average teenager today spends nine hours a day in front of screens. (Yes, you read that correctly.) They need face-to-face communication, you say? Don’t worry—that’s now available through apps like Snapchat! On the contrary, we are realizing more all the time the degree to which the digital life is an artificial one; what we really need is to engage with real people about real issues, which can only happen through genuine personal interaction. In school, a robust rhetoric curriculum—of which the senior thesis is only part—develops the skills needed for high-quality face-to-face discussion and debate, providing opportunities for both formal and informal public speaking. 2. Young people must calmly but vigorously defend their beliefs and ideas. 3. Young people must fight against the misinformation that threatens to drown them. Anything you really need to know can be found on Wikipedia or through a three-second Google search, and any news story you read on Twitter must be true if it confirms your preconceptions. Right? No, not at all. In spite of what some overly-optimistic tech writers have been predicting for years, young people who have grown up with the internet are not as versatile with it as one might expect, and they need as much training as anyone else (if not more) as they learn how to separate what is true from what is false. “Why learn history (when it is already on your phone)?” the title of a recent book asked. There are plenty of reasons, perhaps most of all because without an understanding of how to perform effective research, the information you access through your phone will be woefully misleading and incomplete. The basis for the senior thesis is solid research, which is why students are trained to seek out perspectives on their topics offered in high-quality books and scholarly journal articles. Every year the juniors and seniors travel to the libraries at Southeastern Baptist Theological Seminary and UNC Chapel Hill, where they traverse the stacks in search of sources for the junior and senior thesis papers. Beyond that, students are required to pursue sources on both sides of the debate they are considering. An entire section of their thesis consists of the refutatio, in which they accurately lay out objections to their thesis and answer them. We consider the senior thesis to be our “capstone” project at Cary Christian School because in it the skills students have been cultivating for thirteen years—from logic and rhetoric classes all the way down to those adorable Christmas programs—come together in a remarkable way. They demonstrate that over the years they have learned more than mere facts: they have learned how to learn. The seniors turned in their thesis papers at the end of third quarter, and they are now preparing for their presentations. These will be held in the auditorium from April 1-2, beginning each day at 8:00 A.M. All are welcome to attend! Click here to learn more. 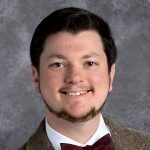 Mr. Patrick Halbrook teaches European History (eleventh grade), Rhetoric II (twelfth grade), and High School electives in Film Studies and Graphic/Website Design. A graduate of Florida College (B.A., Biblical Studies and Liberal Studies) and North Carolina State University (M.A., History), Mr. Halbrook holds Professional ACCS Certification and has taught at Cary Christian School since 2006. When he is not spending time with his wife and four children or designing websites for his side business, he can be found at home or at a local coffee shop trying to make a dent in his preposterously-long reading list. What is Classical and Christian Education, Really?